We have a host of regular shows around Tokyo – so there should be something for all your needs, whether you are a Tokyo resident looking for a laugh, or a performer looking for a stage to get on. This is an overview, but check out the calender for the full schedule. Good Heavens Comedy Club is our flagship stage, every Wednesday in Shimokitazawa from 8.30. Typically featuring 8-10 comedians, and a mixture of experienced and newer performers, this is a great night and not to be missed. Shimokitazawa is a cool neighbourhood and just a short (5-7 mins) train from both Shinjuku and Shimokitazawa. For visiting comedians – this is your first port of call as it is on every week and draws a strong crowd. This show was started in 2017 to meet the demand from the comedians! We have a growing scene with lots of people wanting to jump up and give stand-up a go – this is the place to do it. Typically the 1st & 3rd Monday of the month from 8pm at Titans Craft Beer house in Otsuka (one station next to Ikebukuro on the Yamonote Line). Be there for 19.45 for sign-up on the night! Twice a month at the incredible Two Dogs Taproom in Roppongi – with a special comedy twist! Six comedians split into two teams battling to for points and the audience’s laughter. This show has topical jokes, improvised stand-up – all brand new jokes every single time from Tokyo’s best performers. Oh, and Two Dogs Taproom is one of the nicest bars with the greatest pizza in the whole of Tokyo. Typically the 2nd and 4th Friday of the month at the awesome Tokyo Sports Cafe in Roppongi, this is the perfect way to kick-off your weekend in a true TGIF vibe. 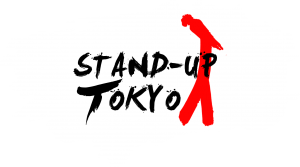 Featuring the best of Tokyo comedy with one headliner doing an extended set, all for just 1000 yen – including a drink. A main-stay of Tokyo comedy for years – and hosted in the loving environment of Vega Wine Bar, check this night out when you can. Held once a month on a Saturday (check the schedule), the show is free and is a mixed showcase of some the best and some of the newer performers on the circuit. Once a quarter on a Saturday, Tokyo’s comedians descend on the town of Fujisawa in Kanagawa – just passed Yokohama. Don’t miss this night though as it is one of the craziest nights we offer; 1000 yen including a drink.